Are you in search for the best sharpening steel that you can use in your kitchen? Then, you're in for a good treat because we'll be reviewing five of the best sharpening steels that are available in the market now. A sharpening steel is different from a sharpening stone because all it does is to maintain the edge of a sharp ﻿﻿﻿﻿knife. It doesn't sharpen dull knives, like what sharpening stones usually do. So, for more facts about this tool and some brands that you can consider, continue reading below. Buck Knives 97082 EdgeTek Tri-Grit Ultra Steel Diamond Knife Sharpener 10"
2. Buck Knives 97082 Edge Tek Tri-Grit Ultra Steel Diamond Knife Sharpener 10"
A sharpening steel is used mainly to make an already sharp knife even sharper. It is recommended that you use this tool on your knife after each use as it removes any fins that are produced on the blade of the knife. Using this tool helps rearrange and realign the edge of the blade to maintain its sharpness. To use this tool, first, place the steel vertically over a cutting board. Next, select the appropriate angle, which usually rests on 20 degrees, then take alternate passes with your knife. Never dig into the steel, instead use gentle slicing motion. You can watch how this is done properly in this video. 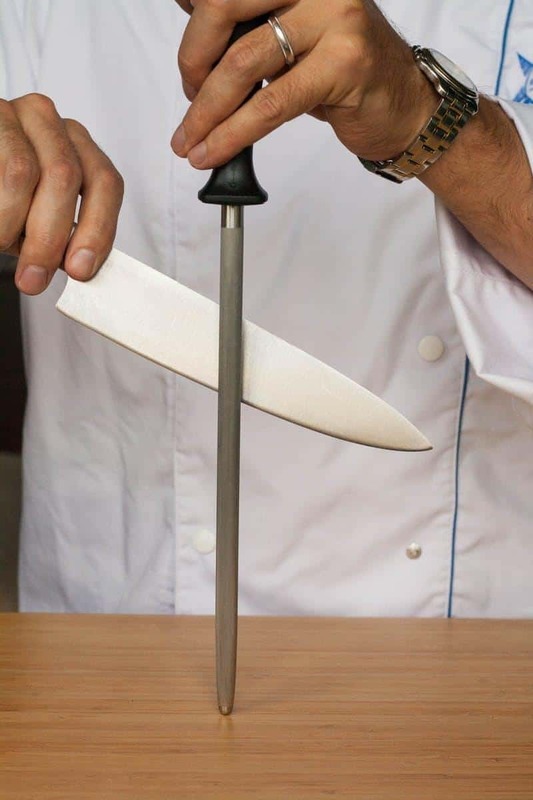 In doing the slicing motion, avoid moving the steel, instead let the knife move. Make sure that only the edge of knife touches the steel, and not the blade's side to prevent scratches. Always be mindful of your hand as you hold the steel, so you won't cut yourself. If you want to buy the best sharpening steel for your knives, here are some features that you need to look for. It is best to choose a rod that is longer than your knife so it can allow a full pass with the blade. Although a short or lightweight rod may still work, you might need to exert more effort and sometimes its results are not as good as its longer or heavy counterpart. Most sharpening steels have a size between 9 inches to 12 inches. For versatility, a 12-inch size is ideal. 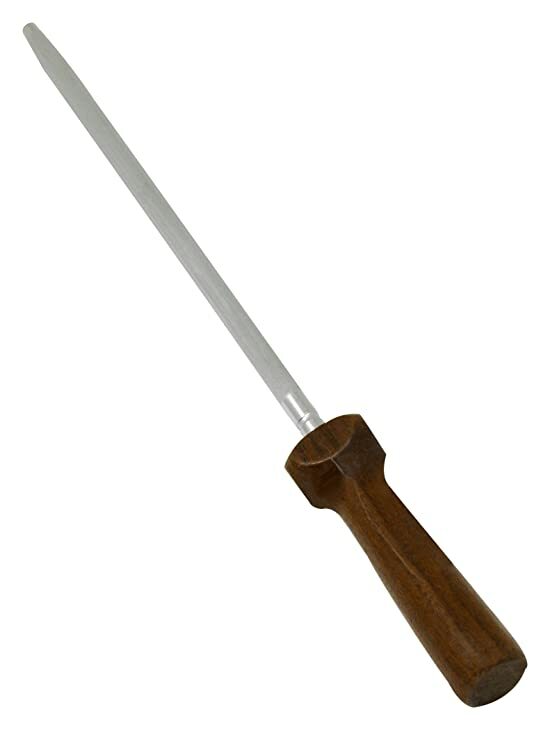 To hold the sharpening steel securely, you need to look for a slip-resistant handle. Your hand should also rest on the handle comfortably. The handle should have the right thickness to allow for a firm grip. Never buy a sharpening steel with a handle that is either too large or too small for your grip because this can easily wear out your wrist while using. To be certain of its firm grip, hold the handle before purchasing. The rod of a sharpening steel is usually made from high-carbon steel. But now, there are already models made from ceramic or diamond steel. All of these materials- steel, ceramic, and diamond- are capable of keeping the fine edge of a sharp edge. However, a diamond rod may be a little harsh for your sharp knives as it sharpens more than it hones, but it can work in any kind of knives. If you look for regular maintenance, look for steel or ceramic. Steel rods can either be completely smooth or have fine ridges. The ridged steel rod may hone the edge a bit, but it tends to wear its down faster. This is why smooth steel rod is superior to its ridged counterpart, but it can't be used with Japanese-made knives because it is delicate. 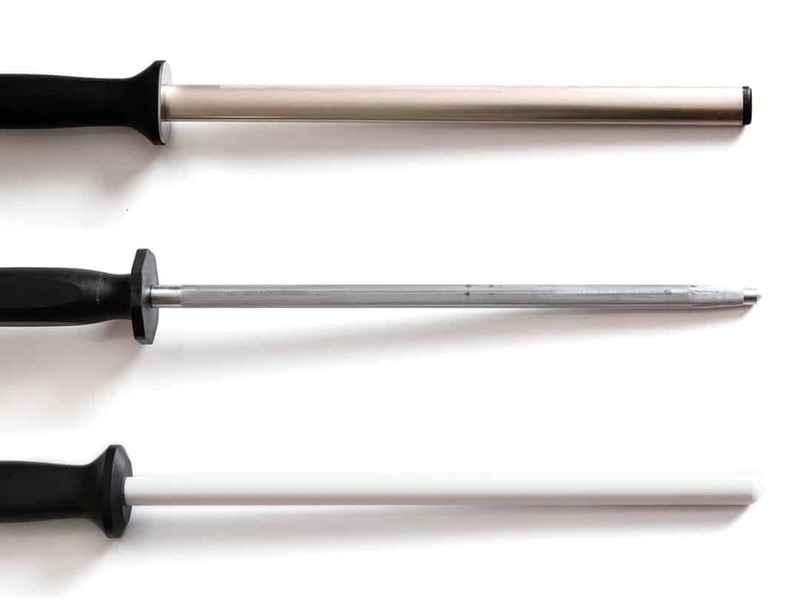 On the other hand, ceramic rod﻿s offer the best features. It is harder enough to work with Japanese knives, but they're less hard than the diamond to not wear off your knife easily. They can also clean the edge of a knife while realigning it like steel rods. Although some metal can be lost with this material, the amount can only be minuscule. To make sure that a ceramic rod won't wear down your knife, look for a fine grit that's 1,000 and up. This Messermeister Knife Sharpener is made from a ceramic rod which makes it ideal to hone various types of knives. Ceramic is hard and has a slightly abrasive feature so it can really sharpen as it hones the edge. 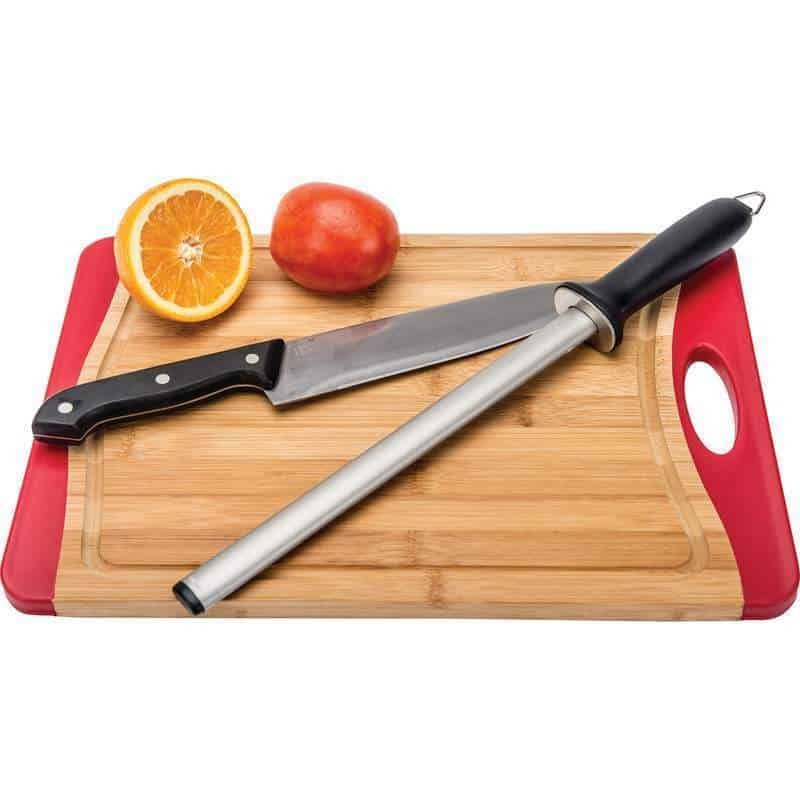 It has a 12-inch size blade that goes well to almost all lengths of a knife. The handle is ergonomically designed with a soft-grip handle that offers a very firm grip. It has a fine grit of 1,200 so this hones the knife smoothly without stripping much of the metal away. For convenient storage, its handle is designed with a loop. This Buck Knives 97082 has a 10-inch diamond coated sharpening surface. Its handle is contoured with a polypropylene material. It has a hand guard to keep the blade from reaching your hand as you slip. This sharpening steel offers three different grits- 1200, 750, and 325. With a weight of 6.9 ounces, this can be used with great ease. You don't have to worry for any defects because this is covered by Buck's Forever Warranty. 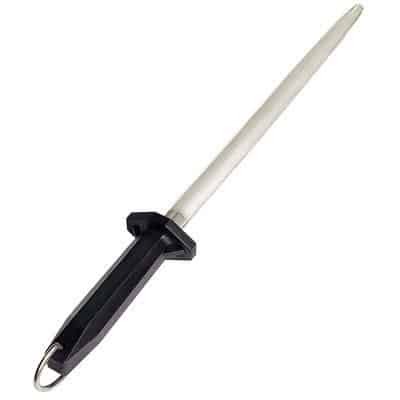 This Winware Sharpening Steel has a stainless steel rod to put an edge on your knife. This 12-inch steel has a handle that measures around 5 inches in length. The handle is made of plastic, making it easy to maintain. 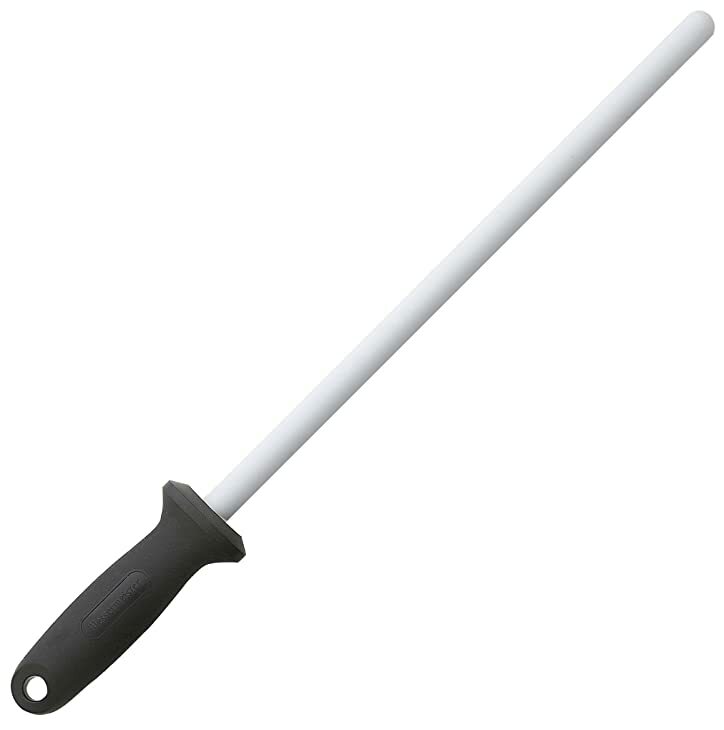 The rod has fine ridges, making it effective in roughing up the edge of a knife while realigning it. This equipment has a hanging loop at the bottom of the handle so you can leave it hanging in your ﻿﻿﻿kitchen for storage. To clean, just wipe with a soft damp cloth. 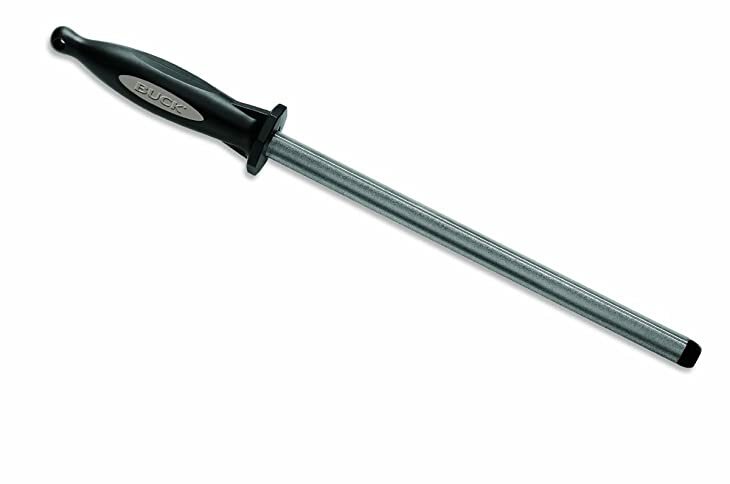 This Wusthof Sharpening Steel has a 10-inch magnetic steel that collects metal fibers. It is designed with a loop at the bottom of the handle for easy storage. A slip-resistant handle fits right in the hand comfortably. This tool can realign the edge of your knife easily thanks to the fine ridges designed along its rod. 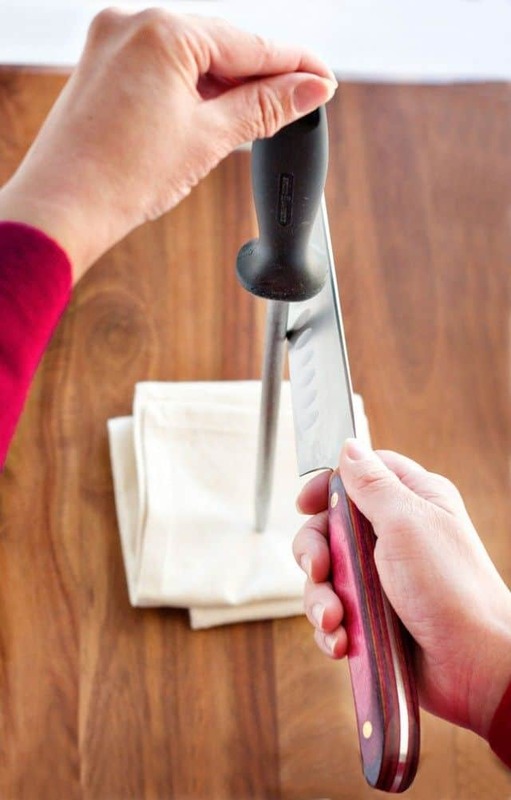 After every sharpening session, make sure to wipe it with a damp cloth to clean. This Chicago Cutlery Walnut Tradition has a 10-inch blade that is made of high-carbon stainless steel. The blade has small ridges so you can be sure that it can lend some tooth on the edge of your knife. The beauty of stainless steel is its can resist rust and stains effectively. It is designed with a comfortable walnut handle fastened with triple-bass rivets for stability. For maintenance, hand wash to clean. Any defects are covered by its lifetime warranty. Among the five products reviewed above, our ratings consider the Messermeister Ceramic Rod Knife Sharpener as the best sharpening steel because it has met most of the features that you should look for. The Messermeister has the right 12-inch size of rod and it's made of ceramic, which is great in keeping the edge of the blade and works with all types of ﻿﻿steel. This model also has a comfortable handle and a hefty rod. For questions or suggestions, let us know in the comments section below. If you like this post, feel free to share it.